The Cretaceous ( /krɪˈteɪʃəs/ , kri-TAY-shəs) is a geologic period and system that spans 79 million years from the end of the Jurassic Period 145 million years ago (mya) to the beginning of the Paleogene Period 66 mya. It is the last period of the Mesozoic Era, and the longest period of the Phanerozoic Eon. The Cretaceous Period is usually abbreviated K, for its German translation Kreide (chalk, creta in Latin). The Jurassic was a geologic period and system that spanned 56 million years from the end of the Triassic Period 201.3 million years ago (Mya) to the beginning of the Cretaceous Period 145 Mya. The Jurassic constitutes the middle period of the Mesozoic Era, also known as the Age of Reptiles. The start of the period was marked by the major Triassic–Jurassic extinction event. Two other extinction events occurred during the period: the Pliensbachian-Toarcian extinction in the Early Jurassic, and the Tithonian event at the end; however, neither event ranks among the "Big Five" mass extinctions. The abbreviation myr, "million years", is a unit of a quantity of 1,000,000 (i.e. 1×106) years, or 31.6 teraseconds. An inland sea is a shallow sea that covers central areas of continents during periods of high sea level that result in marine transgressions. In modern times, continents stand high, eustatic sea levels are low, and there are few inland seas, the largest being Hudson Bay. Modern examples might also include the recently reflooded Persian Gulf, and the South China Sea that presently covers the Sunda Shelf. The Cretaceous–Paleogene (K–Pg) extinction event, also known as the Cretaceous–Tertiary (K–T) extinction, was a sudden mass extinction of some three-quarters of the plant and animal species on Earth, approximately 66 million years ago. With the exception of some ectothermic species such as the leatherback sea turtle and crocodiles, no tetrapods weighing more than 25 kilograms (55 lb) survived. It marked the end of the Cretaceous period and with it, the entire Mesozoic Era, opening the Cenozoic Era that continues today. Pterosaurs were flying reptiles of the extinct clade or order Pterosauria. They existed during most of the Mesozoic: from the late Triassic to the end of the Cretaceous. Pterosaurs are the earliest vertebrates known to have evolved powered flight. Their wings were formed by a membrane of skin, muscle, and other tissues stretching from the ankles to a dramatically lengthened fourth finger. The Cretaceous–Paleogene (K–Pg) boundary, formerly known as the Cretaceous–Tertiary (K-T) boundary, is a geological signature, usually a thin band of rock. K, the first letter of the German word Kreide (chalk), is the traditional abbreviation for the Cretaceous Period and Pg is the abbreviation for the Paleogene Period. Jean Baptiste Julien d'Omalius d'Halloy was a Belgian geologist. He also wrote on races. The Paris Basin is one of the major geological regions of France having developed since the Triassic on a basement formed by the Variscan orogeny. The sedimentary basin is a large sag in the craton, bordered by the Armorican Massif to the west, the Ardennes-Brabant axis to the north, the Massif des Vosges to the east, and the Massif Central to the south. The Cretaceous is divided into Early and Late Cretaceous epochs, or Lower and Upper Cretaceous series. In older literature the Cretaceous is sometimes divided into three series: Neocomian (lower/early), Gallic (middle) and Senonian (upper/late). A subdivision in eleven stages, all originating from European stratigraphy, is now used worldwide. In many parts of the world, alternative local subdivisions are still in use. The Early Cretaceous or the Lower Cretaceous, is the earlier or lower of the two major divisions of the Cretaceous. It is usually considered to stretch from 146 Ma to 100 Ma. The Late Cretaceous is the younger of two epochs into which the Cretaceous period is divided in the geologic timescale. Rock strata from this epoch form the Upper Cretaceous series. The Cretaceous is named after the white limestone known as chalk which occurs widely in northern France and is seen in the white cliffs of south-eastern England, and which dates from this time. In biology, extinction is the termination of an organism or of a group of organisms (taxon), usually a species. The moment of extinction is generally considered to be the death of the last individual of the species, although the capacity to breed and recover may have been lost before this point. Because a species' potential range may be very large, determining this moment is difficult, and is usually done retrospectively. This difficulty leads to phenomena such as Lazarus taxa, where a species presumed extinct abruptly "reappears" after a period of apparent absence. Iridium is a chemical element with symbol Ir and atomic number 77. A very hard, brittle, silvery-white transition metal of the platinum group, iridium is the second-densest metal with a density of 22.56 g/cm3 as defined by experimental X-ray crystallography. At room temperature and standard atmospheric pressure, iridium has a density of 22.65 g/cm3, 0.04 g/cm3 higher than osmium measured the same way. It is the most corrosion-resistant metal, even at temperatures as high as 2000 °C. Although only certain molten salts and halogens are corrosive to solid iridium, finely divided iridium dust is much more reactive and can be flammable. The Yucatán Peninsula, in southeastern Mexico, separates the Caribbean Sea from the Gulf of Mexico, with the northern coastline on the Yucatán Channel. 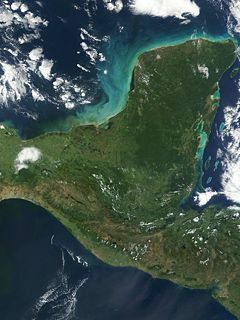 The peninsula lies east of the Isthmus of Tehuantepec, a northwestern geographic partition separating the region of Central America from the rest of North America. It is approximately 181,000 km2 (70,000 sq mi) in area, and is almost entirely composed of limestone. Drawing of fossil jaws of Mosasaurus hoffmanni , from the Maastrichtian of Dutch Limburg, by Dutch geologist Pieter Harting (1866). The high sea level and warm climate of the Cretaceous meant large areas of the continents were covered by warm, shallow seas, providing habitat for many marine organisms. The Cretaceous was named for the extensive chalk deposits of this age in Europe, but in many parts of the world, the deposits from the Cretaceous are of marine limestone, a rock type that is formed under warm, shallow marine circumstances. Due to the high sea level, there was extensive space for such sedimentation. Because of the relatively young age and great thickness of the system, Cretaceous rocks are evident in many areas worldwide. Chalk is a rock type characteristic for (but not restricted to) the Cretaceous. It consists of coccoliths, microscopically small calcite skeletons of coccolithophores, a type of algae that prospered in the Cretaceous seas. In northwestern Europe, chalk deposits from the Upper Cretaceous are characteristic for the Chalk Group, which forms the white cliffs of Dover on the south coast of England and similar cliffs on the French Normandian coast. The group is found in England, northern France, the low countries, northern Germany, Denmark and in the subsurface of the southern part of the North Sea. Chalk is not easily consolidated and the Chalk Group still consists of loose sediments in many places. The group also has other limestones and arenites. Among the fossils it contains are sea urchins, belemnites, ammonites and sea reptiles such as Mosasaurus . In southern Europe, the Cretaceous is usually a marine system consisting of competent limestone beds or incompetent marls. Because the Alpine mountain chains did not yet exist in the Cretaceous, these deposits formed on the southern edge of the European continental shelf, at the margin of the Tethys Ocean. Stagnation of deep sea currents in middle Cretaceous times caused anoxic conditions in the sea water leaving the deposited organic matter undecomposed. Half the worlds petroleum reserves were laid down at this time in the anoxic conditions of what would become the Persian Gulf and the Gulf of Mexico. In many places around the world, dark anoxic shales were formed during this interval. These shales are an important source rock for oil and gas, for example in the subsurface of the North Sea. During the Cretaceous, the late-Paleozoic-to-early-Mesozoic supercontinent of Pangaea completed its tectonic breakup into the present-day continents, although their positions were substantially different at the time. As the Atlantic Ocean widened, the convergent-margin mountain building (orogenies) that had begun during the Jurassic continued in the North American Cordillera, as the Nevadan orogeny was followed by the Sevier and Laramide orogenies. The Cretaceous is justly famous for its chalk; indeed, more chalk formed in the Cretaceous than in any other period in the Phanerozoic. Mid-ocean ridge activity—or rather, the circulation of seawater through the enlarged ridges—enriched the oceans in calcium; this made the oceans more saturated, as well as increased the bioavailability of the element for calcareous nanoplankton. These widespread carbonates and other sedimentary deposits make the Cretaceous rock record especially fine. Famous formations from North America include the rich marine fossils of Kansas's Smoky Hill Chalk Member and the terrestrial fauna of the late Cretaceous Hell Creek Formation. Other important Cretaceous exposures occur in Europe (e.g., the Weald) and China (the Yixian Formation). In the area that is now India, massive lava beds called the Deccan Traps were erupted in the very late Cretaceous and early Paleocene. Flowering plants (angiosperms) spread during this period  , although they did not become predominant until the Campanian Age near the end of the period. Their evolution was aided by the appearance of bees; in fact angiosperms and insects are a good example of coevolution. The first representatives of many leafy trees, including figs, planes and magnolias, appeared in the Cretaceous. On land, mammals were generally small sized, but a very relevant component of the fauna, with cimolodont multituberculates outnumbering dinosaurs in some sites. Neither true marsupials nor placentals existed until the very end,  but a variety of non-marsupial metatherians and non-placental eutherians had already begun to diversify greatly, ranging as carnivores (Deltatheroida), aquatic foragers (Stagodontidae) and herbivores ( Schowalteria , Zhelestidae). Various "archaic" groups like eutriconodonts were common in the Early Cretaceous, but by the Late Cretaceous northern mammalian faunas were dominated by multituberculates and therians, with dryolestoids dominating South America. The apex predators were archosaurian reptiles, especially dinosaurs, which were at their most diverse stage. Pterosaurs were common in the early and middle Cretaceous, but as the Cretaceous proceeded they declined for poorly understood reasons (once thought to be due to competition with early birds, but now it is understood avian adaptive radiation is not consistent with pterosaur decline  ), and by the end of the period only two highly specialized families remained. 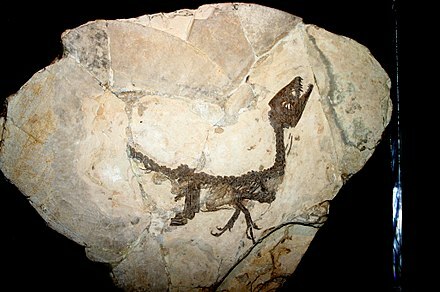 The Liaoning lagerstätte (Chaomidianzi formation) in China is a treasure chest of preserved remains of numerous types of small dinosaurs, birds and mammals, that provides a glimpse of life in the Early Cretaceous. The coelurosaur dinosaurs found there represent types of the group Maniraptora, which is transitional between dinosaurs and birds, and are notable for the presence of hair-like feathers. Tyrannosaurus rex , one of the largest land predators of all time, lived during the late Cretaceous. Up to 2 m long and 0.5 m high at the hip, Velociraptor was feathered and roamed the late Cretaceous. In the seas, rays, modern sharks and teleosts became common. Marine reptiles included ichthyosaurs in the early and mid-Cretaceous (becoming extinct during the late Cretaceous Cenomanian-Turonian anoxic event), plesiosaurs throughout the entire period, and mosasaurs appearing in the Late Cretaceous. Baculites , an ammonite genus with a straight shell, flourished in the seas along with reef-building rudist clams. The Hesperornithiformes were flightless, marine diving birds that swam like grebes. Globotruncanid Foraminifera and echinoderms such as sea urchins and starfish (sea stars) thrived. The first radiation of the diatoms (generally siliceous shelled, rather than calcareous) in the oceans occurred during the Cretaceous; freshwater diatoms did not appear until the Miocene. The Cretaceous was also an important interval in the evolution of bioerosion, the production of borings and scrapings in rocks, hardgrounds and shells. A scene from the early Cretaceous: a Woolungasaurus is attacked by a Kronosaurus . Tylosaurus was a large mosasaur, carnivorous marine reptiles that emerged in the late Cretaceous. Strong-swimming and toothed predatory waterbird Hesperornis roamed late Cretacean oceans. Cretaceous hardground from Texas with encrusting oysters and borings. The scale bar is 10 mm. Rudist bivalves from the Cretaceous of the Omani Mountains, United Arab Emirates. Scale bar is 10 mm. Inoceramus from the Cretaceous of South Dakota. An extinction event is a widespread and rapid decrease in the biodiversity on Earth. Such an event is identified by a sharp change in the diversity and abundance of multicellular organisms. It occurs when the rate of extinction increases with respect to the rate of speciation. Estimates of the number of major mass extinctions in the last 540 million years range from as few as five to more than twenty. These differences stem from the threshold chosen for describing an extinction event as "major", and the data chosen to measure past diversity. The Mesozoic Era is an interval of geological time from about 252 to 66 million years ago. It is also called the Age of Reptiles and the Age of Conifers. The Permian is a geologic period and system which spans 47 million years from the end of the Carboniferous Period 298.9 million years ago (Mya), to the beginning of the Triassic period 251.902 Mya. It is the last period of the Paleozoic era; the following Triassic period belongs to the Mesozoic era. The concept of the Permian was introduced in 1841 by geologist Sir Roderick Murchison, who named it after the city of Perm. The Paleogene is a geologic period and system that spans 43 million years from the end of the Cretaceous Period 66 million years ago (Mya) to the beginning of the Neogene Period 23.03 Mya. It is the beginning of the Cenozoic Era of the present Phanerozoic Eon. The Paleogene is most notable for being the time during which mammals diversified from relatively small, simple forms into a large group of diverse animals in the wake of the Cretaceous–Paleogene extinction event that ended the preceding Cretaceous Period. The United States Geological Survey uses the abbreviation PE for the Paleogene, but the more commonly used abbreviation is PG with the PE being used for Paleocene. 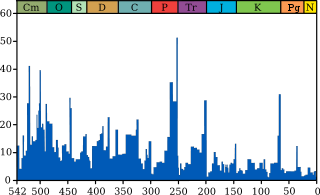 The Phanerozoic Eon is the current geologic eon in the geologic time scale, and the one during which abundant animal and plant life has existed. It covers 541 million years to the present, and began with the Cambrian Period when animals first developed hard shells preserved in the fossil record. Its name was derived from the Ancient Greek words φανερός and ζωή, meaning visible life, since it was once believed that life began in the Cambrian, the first period of this eon. The term "Phanerozoic" was coined in 1930 by the American geologist George Halcott Chadwick (1876–1953). The time before the Phanerozoic, called the Precambrian, is now divided into the Hadean, Archaean and Proterozoic eons. The Triassic is a geologic period and system which spans 50.6 million years from the end of the Permian Period 251.9 million years ago (Mya), to the beginning of the Jurassic Period 201.3 Mya. The Triassic is the first and shortest period of the Mesozoic Era. Both the start and end of the period are marked by major extinction events. The Triassic–Jurassic extinction event marks the boundary between the Triassic and Jurassic periods, 201.3 million years ago, and is one of the major extinction events of the Phanerozoic eon, profoundly affecting life on land and in the oceans. In the seas, a whole class (conodonts) and 23-34% of marine genera disappeared. On land, all archosaurs other than crocodylomorphs and Avemetatarsalia, some remaining therapsids, and many of the large amphibians became extinct. Ammonoids are an extinct group of marine mollusc animals in the subclass Ammonoidea of the class Cephalopoda. These molluscs, commonly referred to as ammonites, are more closely related to living coleoids than they are to shelled nautiloids such as the living Nautilus species. The earliest ammonites appear during the Devonian, and the last species died out in the Cretaceous–Paleogene extinction event. The South Polar region of the Cretaceous comprised the continent of East Gondwana–modern day Australia and Antarctica–a product of the break-up of Gondwana. The southern region, during this time, was much warmer than it is today, ranging from perhaps 4–8 °C (39–46 °F) in the latest Cretaceous Maastrichtian in what is now southeastern Australia. This prevented permanent ice sheets from developing and fostering polar forests, which were largely dominated by conifers, cycads, and ferns, and relied on a temperate climate and heavy rainfall. Major fossil-bearing geological formations that record this area are: the Santa Marta and Sobral Formations of Seymour Island off the Antarctic Peninsula; the Snow Hill Island, Lopez de Bertodano, and the Hidden Lake Formations on James Ross Island also off the Antarctic Peninsula; and the Eumeralla and Wonthaggi Formations in Australia. 2S hydrogen sulfide, developed. Although anoxic events have not happened for millions of years, the geological record shows that they happened many times in the past. Anoxic events coincided with several mass extinctions and may have contributed to them. These mass extinctions include some that geobiologists use as time markers in biostratigraphic dating. Many geologists believe oceanic anoxic events are strongly linked to slowing of ocean circulation, climatic warming, and elevated levels of greenhouse gases. Researchers have proposed enhanced volcanism (the release of CO2) as the "central external trigger for euxinia". The Maastrichtian is, in the ICS geologic timescale, the latest age of the Late Cretaceous epoch or Upper Cretaceous series, the Cretaceous period or system, and of the Mesozoic era or erathem. It spanned the interval from 72.1 to 66 million years ago. The Maastrichtian was preceded by the Campanian and succeeded by the Danian. The Sundance Sea was an epeiric sea that existed in North America during the mid-to-late Jurassic Period of the Mesozoic Era. It was an arm of what is now the Arctic Ocean, and extended through what is now western Canada into the central western United States. The sea receded when highlands to the west began to rise. The Paleocene or Palaeocene, the "old recent", is a geological epoch that lasted from about 66 to 56 million years ago. It is the first epoch of the Paleogene Period in the modern Cenozoic Era. As with many geologic periods, the strata that define the epoch's beginning and end are well identified, but the exact ages remain uncertain. 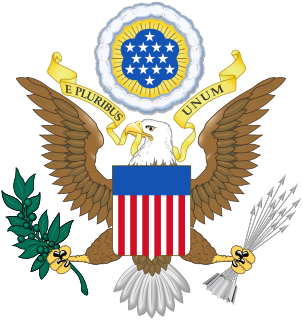 The prehistory of the United States comprises the occurrences within regions now part of the United States of America during the interval of time spanning from the formation of the Earth to the documentation of local history in written form. At the start of the Paleozoic era, what is now "North" America was actually in the southern hemisphere. Marine life flourished in the country's many seas, although terrestrial life had not yet evolved. During the latter part of the Paleozoic, seas were largely replaced by swamps home to amphibians and early reptiles. When the continents had assembled into Pangaea drier conditions prevailed. The evolutionary precursors to mammals dominated the country until a mass extinction event ended their reign. The climate across the Cretaceous–Paleogene boundary is very important to geologic time as it marks a catastrophic global extinction event. 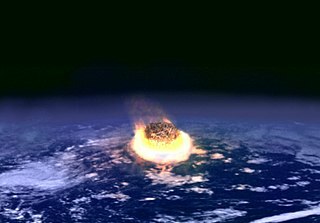 Numerous theories have been proposed as to why this extinction event happened including an asteroid known as the Chicxulub asteroid, volcanism, or sea level changes. While the mass extinction is well documented, there is much debate about the immediate and long-term climatic and environmental changes caused by the event. The terrestrial climates at this time are poorly known, which limits the understanding of environmentally driven changes in biodiversity that occurred before the Chicxulub crater impact. Oxygen isotopes across the K–T boundary suggest that oceanic temperatures fluctuated in the Late Cretaceous and through the boundary itself. 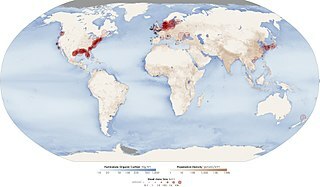 Carbon isotope measurements of benthic foramifinera at the K–T boundary suggest rapid, repeated fluctuations in oceanic productivity in the 3 million years before the final extinction, and that productivity and ocean circulation ended abruptly for at least tens of thousands of years just after the boundary, indicating devastation of terrestrial and marine ecosystems. Some researchers suggest that climate change is the main connection between the impact and the extinction. The impact perturbed the climate system with long-term effects that were much worse than the immediate, direct consequences of the impact. ↑ Great Soviet Encyclopedia (in Russian) (3rd ed.). Moscow: Sovetskaya Enciklopediya. 1974. vol. 16, p. 50. ↑ The term "Cretaceous" first appeared in English in: Henry Thomas De La Beche, A Geological Manual (Philadelphia, Pennsylvania: Carey & Lea, 1832). From page 35: "Group 4. (Cretaceous) contains the rocks which in England and the North of France are characterized by chalk in the upper part, and sands and sandstones in the lower." ↑ Glossary of Geology (3rd ed.). Washington, D.C.: American Geological Institute. 1972. p. 165. ↑ Renne, Paul R.; et al. (2013). "Time scales of critical events around the Cretaceous-Paleogene boundary". Science. 339 (6120): 684–688. Bibcode:2013Sci...339..684R. doi:10.1126/science.1230492. PMID 23393261. ↑ Vennari, Verónica V.; Lescano, Marina; Naipauer, Maximiliano; Aguirre-Urreta, Beatriz; Concheyro, Andrea; Schaltegger, Urs; Armstrong, Richard; Pimentel, Marcio; Ramos, Victor A. (2014). "New constraints on the Jurassic–Cretaceous boundary in the High Andes using high-precision U–Pb data". Gondwana Research . 26 (1): 374–385. Bibcode:2014GondR..26..374V. doi:10.1016/j.gr.2013.07.005 . Retrieved 16 January 2016. ↑ Jaramillo, Jessica. "Entrevista al Dr. Víctor Alberto Ramos, Premio México Ciencia y Tecnología 2013" (in Spanish). Si logramos publicar esos nuevos resultados, sería el primer paso para cambiar formalmente la edad del Jurásico-Cretácico. A partir de ahí, la Unión Internacional de la Ciencias Geológicas y la Comisión Internacional de Estratigrafía certificaría o no, depende de los resultados, ese cambio. ↑ Dougal Dixon et al., Atlas of Life on Earth, (New York: Barnes & Noble Books, 2001), p. 215. 1 2 Kazlev, M.Alan. "Palaeos Mesozoic: Cretaceous: The Berriasian Age". Palaeos.com. Archived from the original on 20 December 2010. Retrieved 18 October 2017. ↑ Alley, N. F.; Frakes, L. A. (2003). "First known Cretaceous glaciation: Livingston Tillite Member of the Cadna‐owie Formation, South Australia". Australian Journal of Earth Sciences. 50 (2): 139. Bibcode:2003AuJES..50..139A. doi:10.1046/j.1440-0952.2003.00984.x. ↑ Frakes, L. A.; Francis, J. E. (1988). "A guide to Phanerozoic cold polar climates from high-latitude ice-rafting in the Cretaceous". Nature. 333 (6173): 547. Bibcode:1988Natur.333..547F. doi:10.1038/333547a0. ↑ Nordt, Lee, Stacy Atchley, and Steve Dworkin. "Terrestrial Evidence for Two Greenhouse Events in the Latest Cretaceous." Baylor University, 6 Oct. 2003. Web. 10 Nov. 2012. ↑ Foulger, G.R. (2010). Plates vs. Plumes: A Geological Controversy. Wiley-Blackwell. ISBN 978-1-4051-6148-0. ↑ Bornemann, Norris RD; Friedrich, O; Beckmann, B; Schouten, S; Damsté, JS; Vogel, J; Hofmann, P; Wagner, T (Jan 2008). "Isotopic evidence for glaciation during the Cretaceous supergreenhouse". Science. 319 (5860): 189–92. Bibcode:2008Sci...319..189B. doi:10.1126/science.1148777. PMID 18187651. 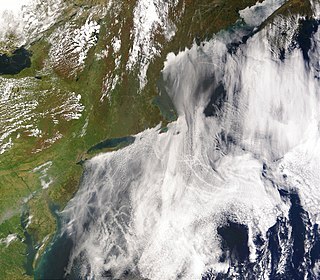 ↑ "Warmer than a Hot Tub: Atlantic Ocean Temperatures Much Higher in the Past" PhysOrg.com. Retrieved 12/3/06. ↑ Coiro, Mario; Doyle, James A.; Hilton, Jason (2019-01-25). "How deep is the conflict between molecular and fossil evidence on the age of angiosperms?". New Phytologist. doi:10.1111/nph.15708. ↑ "Introduction to the Bennettitales". University of California Museum of Paleontology. Retrieved 30 May 2014. ↑ Halliday, Thomas John Dixon; Upchurch, Paul; Goswami, Anjali (29 June 2016). "Eutherians experienced elevated evolutionary rates in the immediate aftermath of the Cretaceous–Palaeogene mass extinction". Proc. R. Soc. B. 283 (1833): 20153026. doi:10.1098/rspb.2015.3026. PMC 4936024 . PMID 27358361 . Retrieved 18 October 2017– via rspb.RoyalSocietyPublishing.org. ↑ Wilton, Mark P. (2013). Pterosaurs: Natural History, Evolution, Anatomy. Princeton University Press. ISBN 978-0691150611. 1 2 "Life of the Cretaceous". www.ucmp.Berkeley.edu. Retrieved 18 October 2017. 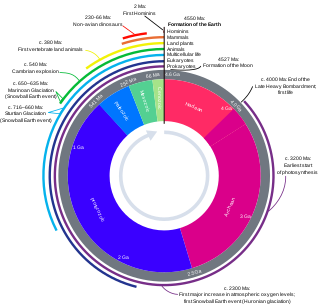 ↑ "EVOLUTIONARY/GEOLOGICAL TIMELINE v1.0". www.TalkOrigins.org. Retrieved 18 October 2017. ↑ Wilf, P; Johnson KR (2004). "Land plant extinction at the end of the Cretaceous: a quantitative analysis of the North Dakota megafloral record". Paleobiology. 30 (3): 347–368. doi:10.1666/0094-8373(2004)030<0347:LPEATE>2.0.CO;2. ↑ Kauffman, E (2004). "Mosasaur Predation on Upper Cretaceous Nautiloids and Ammonites from the United States Pacific Coast". PALAIOS. 19 (1): 96–100. doi:10.1669/0883-1351(2004)019<0096:MPOUCN>2.0.CO;2 . Retrieved 17 June 2007. 1 2 Shehan, P; Hansen, TA (1986). "Detritus feeding as a buffer to extinction at the end of the Cretaceous". Geology. 14 (10): 868–870. Bibcode:1986Geo....14..868S. doi:10.1130/0091-7613(1986)14<868:DFAABT>2.0.CO;2 . Retrieved 4 July 2007. ↑ Aberhan, M; Weidemeyer, S; Kieesling, W; Scasso, RA & Medina, FA (2007). "Faunal evidence for reduced productivity and uncoordinated recovery in Southern Hemisphere Cretaceous–Paleogene boundary sections". Geology. 35 (3): 227–230. Bibcode:2007Geo....35..227A. doi:10.1130/G23197A.1. ↑ Sheehan, PM; Fastovsky, DE (1992). "Major extinctions of land-dwelling vertebrates at the Cretaceous–Paleogene boundary, eastern Montana". Geology. 20 (6): 556–560. Bibcode:1992Geo....20..556S. doi:10.1130/0091-7613(1992)020<0556:MEOLDV>2.3.CO;2 . Retrieved 22 June 2007. Yuichiro Kashiyama; Nanako O. Ogawa; Junichiro Kuroda; Motoo Shiro; Shinya Nomoto; Ryuji Tada; Hiroshi Kitazato; Naohiko Ohkouchi (May 2008). "Diazotrophic cyanobacteria as the major photoautotrophs during mid-Cretaceous oceanic anoxic events: Nitrogen and carbon isotopic evidence from sedimentary porphyrin". Organic Geochemistry. 39 (5): 532–549. doi:10.1016/j.orggeochem.2007.11.010. Ovechkina, M.N. ; Alekseev, A.S. (2005). "Quantitative changes of calcareous nannoflora in the Saratov region (Russian Platform) during the late Maastrichtian warming event" (PDF). Journal of Iberian Geology . 31 (1): 149–165. Archived from the original (PDF) on August 24, 2006. Rasnitsyn, A.P. and Quicke, D.L.J. (2002). History of Insects. Kluwer Academic Publishers. ISBN 978-1-4020-0026-3. CS1 maint: Multiple names: authors list (link)—detailed coverage of various aspects of the evolutionary history of the insects. Taylor, P. D.; Wilson, M. A. (2003). "Palaeoecology and evolution of marine hard substrate communities". Earth-Science Reviews. 62 (1): 1–103. Bibcode:2003ESRv...62....1T. doi:10.1016/S0012-8252(02)00131-9. Wikimedia Commons has media related to Cretaceous . Look up cretaceous in Wiktionary, the free dictionary. "Cretaceous System" . Encyclopædia Britannica . 7 (11th ed.). 1911. pp. 414–418.